Back in July, via Peacock Equity, GE and its subsidiary NBC Universal, invested in in-game advertising network IGA Worldwide $25m Series B Financing. Now in a move best labeled as somewhat curious, NBCU and IGA have struck an operational deal too. 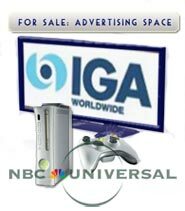 According to a press release issued Tuesday, IGA and NBCU have made a pact that will allow NBCU’s ad sales force to sell inventory from IGA’s "Radial" in-game ad network. In-Game Advertising offers the ability to serve dynamic advertising within a video game. The common example is the billboard in the background of a sporting game. Once upon a time it might have been available for a one time "product placement" where a sponsor bought the rights in perpetuity. But now, thanks to Internet technologies, in-game ads allow that billboard to be sold repeatedly and managed as if it’s real advertising real estate. Through net connections (for consoles or computer based games), the billboard (or other ads) can be changed similar to the way banners are changed on a web page. With in-game ads, media buyers can buy time-based ads and game publishers can derive an ongoing stream of revenue. The marketplace for in-game advertising is relatively small today. It generated slightly less than $80m in 2006. But the entire industry (which includes static product placement ads and dynamic ad networks) is forecast to reach as much as $971m by 2011 (according to Yankee group). Other market research firms similarly predict rapid and expansive growth for the industry. But those projections don’t discount the curiosity of NBC getting involved. While the media conglomerate is more than just a TV and Movie entertainment company, and they do derive a substantial portion of revenue from advertising, gaming is far from their core focus areas. Even with digital strategies becoming more prominent (see the launch of Hulu), NBCU still draws more than half of operating profits from cable TV which CEO Jeff Zucker has acknowledged "cable is the real driver of this company." Nick Johnson, Vice President, NBC Universal Digital Media Advertising Sales said of the IGN deal “[They] are focused on creating multi-platform solutions for our marketing clients, ensuring they achieve their campaign goals and connect with engaged consumers wherever they are spending their time." He also acknowledged that virtual worlds and gaming is one of the fastest growing mediums in the world. Those comments would suggest either that customers have been asking for in-game opportunities, or much more likely, that NBC sees what’s hot and high growth in adverising and is trying to jump on the "bundled" bandwagon. It’s true one-stop shopping ad buys will be more efficient for media planners and are an expected consequence of media convergence. (why after all do 3 ad purchases if you can handle one through the same company). It’s just hard to imagine NBCU will be one of those company that crosses all media dividing lines to offer truly bundled media buys. Then again, you can’t fault them for taking a few small steps to leave the option open. They’ve got no reason to let Microsoft, Google, Yahoo and the rest of the technology industry steal Madison Avenue’s pot of gold without a fight. Given the costs are likely low for NBCU, it’s probably not much of a gamble from a cost benefit standpoint. Still it seems a bit of a science-project (and that’s even with their strong Internet footprint through owned sites like iVillage and others). It’s hard to value this move as anything more than a forward looking experiment. Even so, it’s worth chalking up on the board as another advocate for the promise of in-game advertising; and for that matter, evidence of how the gaming world seems to be changing. Dynamic Gaming anyone?